Highest supported resolution is 4k? I am trying to inport CineForm '422 High' 5.2k Gopro fusion 360 footage into powerdirector but it only shows up as an audio file. I also tried ProRes 422 in 5.2k but have the same result. Only H.264 in 4k works with powerdirector. Is 4k the absolute highest 360 resolution I can work with? Too bad if so as the camera supports 5.2k and I've recorded a lot of video in that format already. Just want to confirm my suspision. Quote I am trying to inport CineForm '422 High' 5.2k Gopro fusion 360 footage into powerdirector but it only shows up as an audio file. I also tried ProRes 422 in 5.2k but have the same result. Only H.264 in 4k works with powerdirector. Is 4k the absolute highest 360 resolution I can work with? Too bad if so as the camera supports 5.2k and I've recorded a lot of video in that format already. Just want to confirm my suspision. Other users may have the answer, but in the mean time could you upload a short clip to a cloud sharing service and post the link here? That way people can try out some other conversion options as well. When I imported it int PD17 the thumbnail was white, and when I previewed it or placed on the timeline I heard the audio but the video was nothing but white. I wrote up a whole procedure on how to set up and use MagicYUV with PD about 3 years ago, but I had some serious things to deal with in my life at that time, and I stopped posting soon afterwards. None of that info remains on the forum, so I'm not sure how well that whole topic might be received at this point. In short, the issue you're having is because PD doesn't natively work with the Cineform codec. It's a simple matter of converting it into a compatible format, and I believe there are many posts in the archives dealing with that situation. Unfortunately the 3 items are not supported in current PowerDirector: 5.2K resolution, CineForm and ProRes codec. With all due respect, The King is referring to the "out-of-the-box" (or freshly-downloaded) state of PowerDirector. He's correct that it doesn't come with either CineForm or ProRes codecs, and the maximum production profiles are set at 4k. That doesn't mean you can't use PD with 5.2k clips, it just means you have to accesorize and customize it! Search the forum for which HD/4k formats people like using with PD, and how they convert the clips. As I mentioned in myu last post, MagicYUV is my hands-down favorite and you can get the older rev 1.2 codec for free, or pay $9 for the improved v2.0. Get the trial version before you pay. I use VirtualDub2 (VDub2) to do the conversion to MagicYUV, then just import the clip(s) into PD. You'll probably want to use Shadow Files to speed up PD because there's just so much data to move around when you're trying to edit any 5.2k clips. You'll also need to create a custom profile to produce @ 4992x2946 resolution. Follow the excellent advice of ynotfish in this thread for the detailed instructions. I've attached the H.265 MP4 profile I used to produce my sample clip, but you can choose H.264 or other options. I've uploaded it to YT, but you'll have to download the clip from my OneDrive folder (here's a link) to get the full res version to play with on your end. Good Luck, and please post back with any questions! question on using VirtualDub and the Codec. Does that change the video aspect ratio and/or metadata? 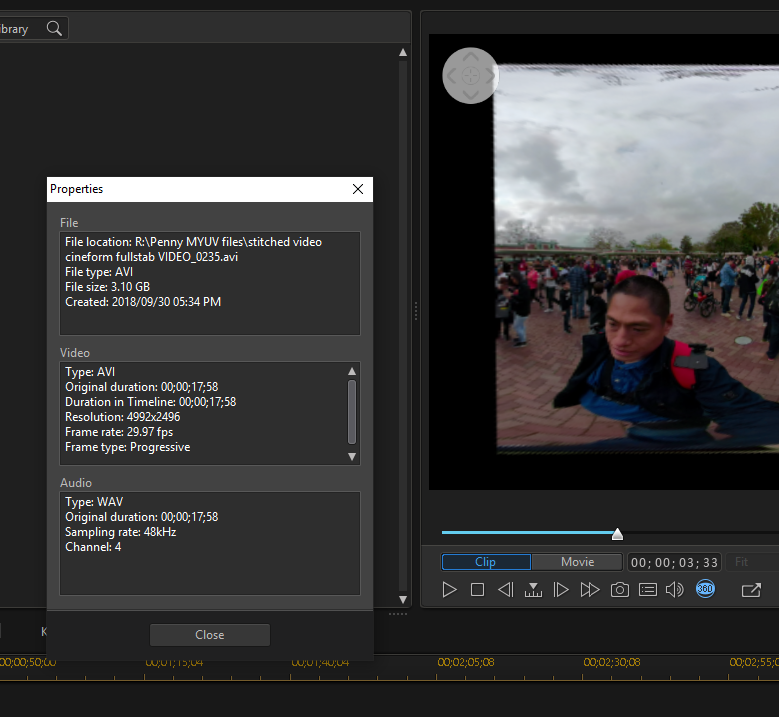 The issue I have if I export a video file with the Insta360 desktop app to a mp4 format its still showing correctly in the nadirs when viewed in VLC or similar, BUT if I go then to another editor like DaVinci I loose that metadata after editing. When I then re-inject it as equirectangular spherical, I get black spots at the nadirs. Even when the image ratio is set to 2:1. Regarding DaVinci I do get an almost perfect metadata injection without backspots now. What one does need to do (and I did previously wrong!) is to set the exact resolution in the project settings BEFORE importing. The resolution of the mp4 exported from the Insta360 Desktop is the one to use. I did that now sucessfully by setting the project resolution & importing & exporting with custom 4k 3840x1920 resolution. After export reinject metadata as spherical. Result has minute distortion at nadir. 5.7k @ 5760x2880 does not work in DaVinci either. Can't even set that as import setting. DaVinci does not support MagicYUV. Wiill that happen when I use the work flow with Inst30OneX Desktop App-VirtualDub2-MagicYUV-PD17? Does Cyberlink have any plans to add the 5.2 GoPro support, or at least re-release the Magic+PD plug in so we can use the free version of the MagicYUV 1.2 codec? or an updated version for MagicYUV 2.0? I can convert the video to the MagicYUV then bring it into PD, but then it is almost impossible to edit with the response time. 360 videos look better in the oculus go at 5.2K then they do at 4K. If I had known this limitation of PD17 early on I would have went with the Adobe Premier subscription. Quote Does Cyberlink have any plans to add the 5.2 GoPro support, or at least re-release the Magic+PD plug in so we can use the free version of the MagicYUV 1.2 codec? or an updated version for MagicYUV 2.0? First, this is a user forum, and nobody here other than the moderator has any insight as to whether or not Cyberlink will make any specific changes down the road. Second, I am the main architect of the Magic+PD workflow, and Cyberlink never offered it as a plug-in nor offered any support for MagicYUV. Along with 2 other motivated users, our team did all of the testing and strove to provide support here on the forum back at the end of 2015. Unfortunately, I had some significant life events occur shortly afterwards, and I had not been active on the forum until last September. 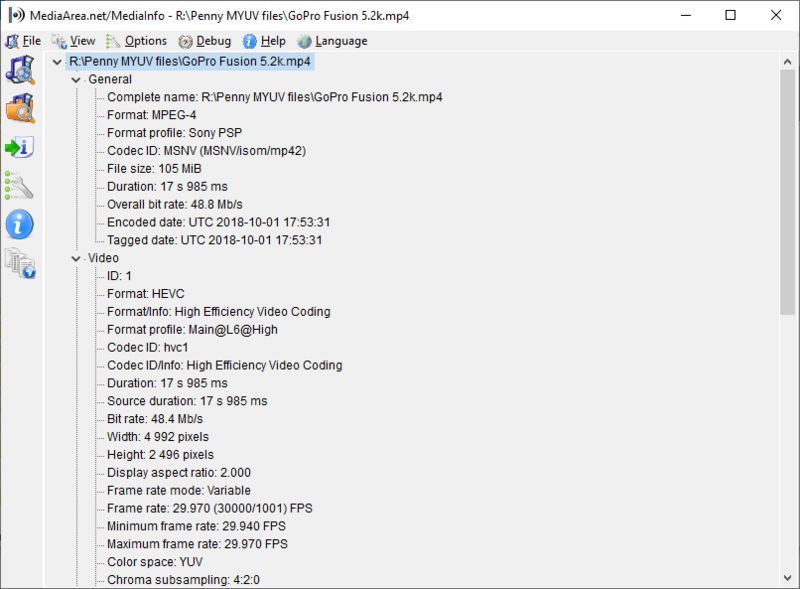 Third, this thread provides the exact steps for creating a 5.2k produce profile that will get your MagicYUV clips out of PD and into your Oculus, so even though that amazing codec isn't "officially" supported, there are no limitations on using it or on producing the desired UHD video. Please post back if you have any questions about the steps needed. Also, inmy opinion, V2.0 of MYUV is definitely worth the $9 fee that its author (Balázs Oroszi) is asking.